Nigel Farage: the European Right Wing's new star. Possibly as brash as Ted Cruz, savvy as Rand Paul, and as plain-spoken as Walter Jones, the MEP and leader of the UK Independence Party has just delivered a stunning electoral upset to England. It is a public rebuke of the growing web of the European Union: a large segment of the British public apparently wants to be left alone by the EU both politically and economically, and to reduce the influx of immigrants. Libertarian: Pallas trine Sun, trine Mars (ruler of Sun), and opposite Venus, ruler of Mercury. Mercury conjunct Jupiter, ruler of Pallas. Authoritarian: Pallas relatively widely square Pluto. This is a strong, mostly libertarian signature. There are zero indicators of left-wing economics. Farage's chart is 100% free-market capitalist. Conservative: North Node in Cancer. This is not the strongest possible indicator, but it's the only one here I can see. Farage defaults to cultural-conservative positions, probably partially mitigated by the strong Pallas. This probably explains his conservative but not particularly passionate stance on immigration. Pluto and Uranus Rising: perfect for someone whose raison d'etre seems to be the fomenting of change and disruption. Mercury conjunct Jupiter, trine Uranus, and sextile Saturn: pubic, populist speech regarding breaking away in the context of government. 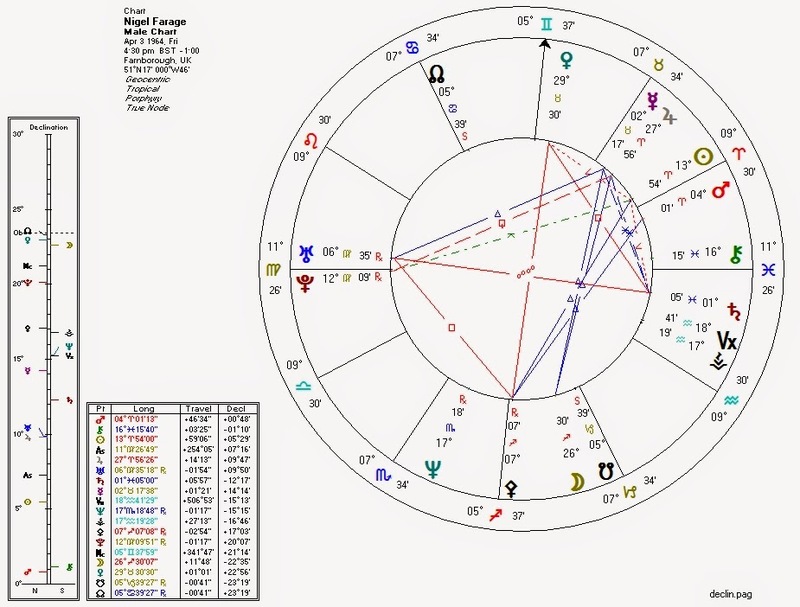 Mars widely conjunct Sun in Aries: a really fiery guy. Pallas on the IC: a born fighter. Rand Paul isn't too bad, but it might be fun to see a guy like this in the US stir things up. Documentary: Nigel Farage, Who Are You?